A Role MUST be given to each User or they will not be able to login and access the system. 1. 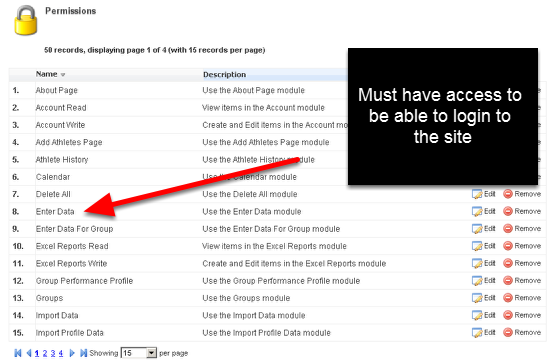 System Permissions include the modules that a Users can access: such as Performance Alerts, Athlete history, the Sidebar, Excel Reports and the like. For a full list of System Permissions see the lesson on "System Permissions in Roles"
Each user has to be assigned at least one Role before they can access the system. You system permissions may include any of modules in the above image. 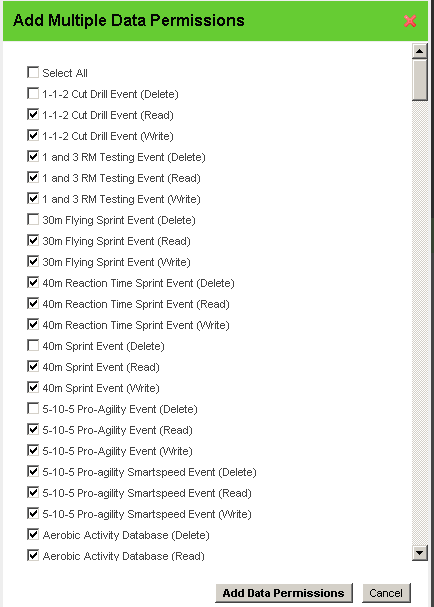 Your system permissions will be unique to your system and the data that your organisation/sport captures (as shown in the image here). All of the Data Permissions for Read, Write, Delete, Calendar and Linked Permissions are explained in the next lesson.